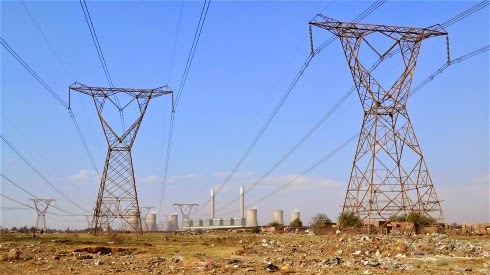 MASAKHANE, 8 September 2014 (IRIN) - South Africa’s dependence on coal to generate 85 percent of its electricity is taking a substantial toll on human health, according to environmental groups. A recent report from Greenpeace estimates that up to 2,700 premature deaths are caused every year by air pollution emissions from the country’s 16 coal-fired power plants. Greenpeace released the report in the wake of an application by Eskom, South Africa’s public power utility, to postpone compliance with new minimum emissions standards aimed at reducing the damaging health impacts of air pollution. The new standards are particularly vital for the country’s north-eastern Mpumalanga Province where 12 coal-fired power plants are clustered on the western high-altitude side of the province known as the Highveld. The power stations pump out sulphur dioxide (SO2), nitrogen dioxide (NO2) and particulate matter at levels that are often more than double than those recommended by the World Health Organization (WHO). As a result, levels of air pollution in Mpumalanga’s Highveld are the highest in the country and among the highest in the world, according to news reports. Thursday is “coal day” at Masakhane, an informal settlement 15km east of eMalahleni (formerly Witbank) in Mpumalanga. Locals line up with wheelbarrows to collect their weekly allotment of free coal delivered by a neighbouring mine. The smoking stacks of Duvha Power Station are clearly visible on Masakhane’s near horizon. Looming above the settlement are electricity pylons supporting power lines that deliver thousands of megawatts of electricity to other parts of South Africa - but not to this collection of several hundred shacks and crumbling brick dwellings. It is a windy, late winter’s day and some residents wear masks to prevent gusts of coal dust blowing into their mouths and nostrils as they fill their wheelbarrows. But the dust is unavoidable; it coats everything in a fine, gritty layer - and that is just the stuff you can see. It is the invisible pollutants emanating from Duvha’s stacks that health and environmental experts are more concerned about, but that Masakahane’s residents are largely unaware of. Her son worked at Duvha for six years before developing mental health problems. The family now survive on social grants. Their shack is a short distance from where their neighbours are collecting coal, but Catherine and her daughter stay away for fear of aggravating their asthma. “I’ve been in bed the last three weeks and I’m coughing a lot; so much I vomit,” said Catherine. WHO describes outdoor air pollution as a major environmental health problem estimated to cause 3.7 million premature deaths worldwide in 2012. While NO2 has been linked to reduced lung function and SO2 causes numerous respiratory problems, it is particulate matter (PM) that affects people more than any other pollutant, according to WHO. The major components of PM include sulfate, nitrates, ammonia, sodium chloride, black carbon and mineral dust. The most health-damaging particles are those with a diameter of 10 microns or less (PM10 and PM2.5) which can penetrate deep inside the lungs and even into the bloodstream. Chronic exposure to these particles increases the risk of developing respiratory and cardiovascular diseases as well as lung cancer. Children are particularly at risk because of their developing systems and the fact that they tend to spend more time outside. People with compromised immune systems, such as those living with HIV, are also especially vulnerable. According to WHO, there is no such thing as a safe concentration of PM. Even at very low concentrations, it has health impacts. While WHO has set its guideline limits at an annual average of 20 micrograms per cubic metre of air volume for PM10 and 10 micrograms per cubic metre for PM2.5, South Africa’s standards are significantly more lax. Currently, concentrations of PM2.5 are allowed at 25 micrograms per cubic metre, but are due to be lowered to 20 by January 2016. Local municipalities are responsible for monitoring ambient air quality, but often lack capacity to do so. Although the government designated Mpumalanga’s Highveld region a priority area for air quality in 2007, pollution levels there have continued to increase as Eskom has returned three moth-balled coal-fired power stations to service. Even the current relatively weak standards for levels of PM are regularly exceeded (see graph), particularly in the winter months when there is less hot air rising to disperse pollutants. In 2010, the Department of Environmental Affairs (DEA) published new standards for industrial emissions, including those from coal-fired power stations aimed at reducing pollution levels in accordance with the country’s Air Quality Act. Eskom was given until April 2015 to bring its power plants into compliance with the standards, and until 2020 to comply with stricter standards. However, in December 2013, Eskom applied to the DEA for rolling postponements to comply with the minimum emissions standards. The utility argued, among other things, that the benefits of compliance did not justify the R200 billion (US$18.6 billion) cost of retrofitting its plants with the necessary filters and technologies and the need for plant downtime while they were installed. Environmental groups representing a number of communities in Mpumalanga have vehemently opposed Eskom’s applications, which have yet to be granted by the DEA. They argue that not only has Eskom been aware that they would need to meet stricter emissions standards since 2005 and failed to act, but it has greatly over-estimated the costs of compliance and failed to take into consideration the health and social costs of non-compliance. “Our clients argue that, while Eskom considers the installation of emission abatement processes too costly, the future effects on health, the environment and water resources as a result of coal-fired power stations and coal mining may be extremely costly for the country as a whole,” said Sylvia Kamanja, a lawyer with the Centre for Environmental Rights which has submitted detailed objections to Eskom’s applications. The Greenpeace report projected that Eskom’s continued non-compliance with minimum emissions standards would result in approximately 20,000 premature deaths over the remaining life of its power plants. In a statement, Eskom responded that “the claim that people could perish every year from illnesses related to air pollution…is based on some incorrect assumptions, and has not taken into account measures that Eskom has and will be implementing to mitigate emissions from its power stations”. Communities like Masakhane face a double burden of outdoor air pollution as well as indoor air pollution caused by having to burn coal and wood in their homes because they lack access to affordable electricity. Most of the residents IRIN spoke to blamed persistent coughs and sinus problems on inhaling smoke while cooking and indeed, this is the line that Eskom has consistently taken in defending its contributions to poor air quality. However, a July 2014 report by local environmental justice NGO groundWork, found that in Mpumalanga’s Highveld area, the health risks related to outdoor air pollution resulting from Eskom’s emissions were three times higher than those associated with burning coal indoors. The report also found that 51 percent of all hospital admissions and deaths in the area due to outdoor air pollution could be attributed to emissions from Eskom’s power stations. Eskom, which has struggled in recent years to supply the country with adequate power, has not made public a de-commissioning schedule for its aging power plants. Currently, it is building two new power stations. One, called Kusile, is being built in Mpumalanga and, when completed, will be the largest coal-fired power station in the world.